Some inventions from the present are like taken from old futuristic movies or even from our dreams. Under the leadership of Nimesha Ranasinghe the National University of Singapore came up with his cool invention. This is a great way to see how technology and innovation create fun ideas and are applied in the most amazing ways. 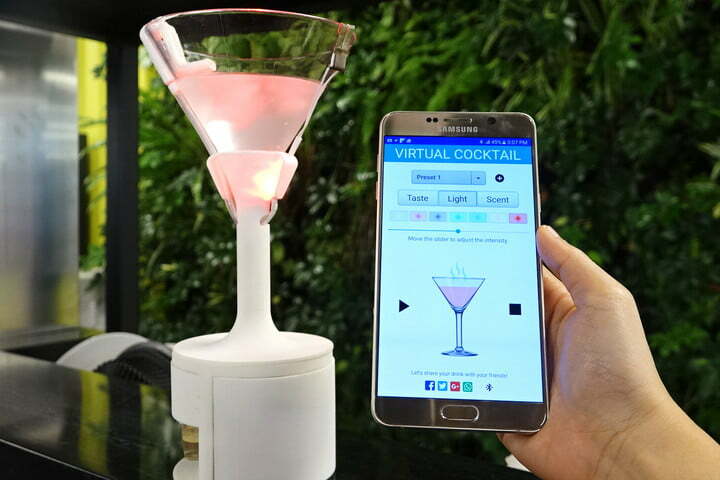 The Vocktail is a virtual cocktail for pairing digital taste, smell and color sensations. It’s an interactive drinking tool that digitally simulates multisensory flavour experiences. It uses taste, smell, and visual (color), to create virtual flavors and supplement the existing flavors of a beverage. The system is attached with a mobile application that allows users to create virtual flavor sensations by configuring each of the stimuli via Bluetooth. This innovation can trick you into thinking that you are drinking pretty much anything you can imagine! Oh we would love to try a few drinks from this glass!! This cup uses an LED light to alter the color of your drink, it uses electrodes placed around the rim which stimulate the tongue so that it taste the liquid as salty, sweet or sour and it uses three smell chambers and air pump which springs odour as the person drinks, the smell component capable of fooling your nose into tasting a variety of favours. Imagine having one of these while pregnant or on a diet! Anyways, keep those minds working as the possibilities are endless! If you have a great or crazy idea that you would love to develop give us a call we can help!